Apparently the VHD was not given the name that it should have. But given that filename, everything is as expected and booting is OK.
Can you give me the makebt\wim_info\wiminfo.txt file for that Win 8.1 case ? There is something not as expected in that file, so that parsing goes wrong. Well yes, I only wanted to report item by item to let you know all was checked carefully, not only just reporting the first thing saw. VHD file was created with wrong name W10x64_ES_1.vhd, it should be W8.1x64_ES_1.vhd or 8.1x64_ES_1.vhd. I hope alacran can provide the makebt\wim_info\wiminfo.txt file so that I can see why parsing goes wrong in his case. In Windows 7 OS then bcdboot.exe 7/8/10 cannot make the VHD internal BCD entry and that is the cause of the problem that you encountered. 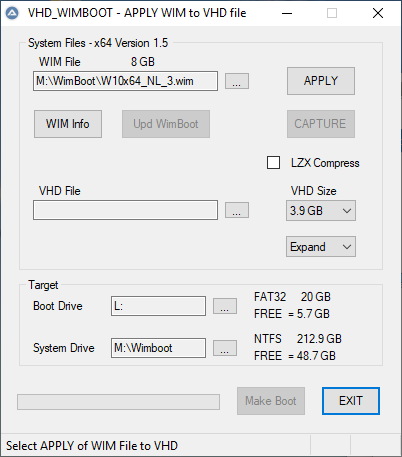 I have no solution for this problem and so the program VHD_WIMBOOT needs Windows 10 Or Windows 8 / 8.1 OS. The failure in giving the VHD the right name is solved and for Windows 8.1 the extra dot in the VHD filename is removed. Thanks for this new version, if the program is not compatible with 7, it may not be a big issue, but it is good we now are aware of that before running it. About the dot on 8.1 I'm glad you fixed it. but also a warning like: Do not use dot(s) or espaces on files names could be enough, sorry for the extra work my friend. Just downloaded, I'll run some tests ASAP and let you know of my findings. 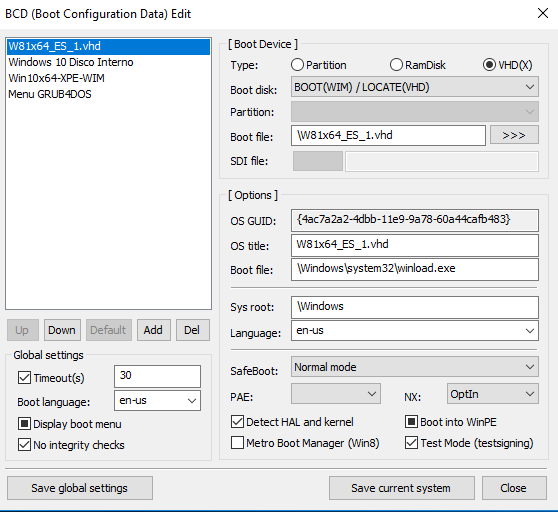 If I get this right, you could boot (Wimboot) Windows 7 but you stop because the BCDBOOT cannot make a "correct" BCD entry for it? Sorry for the delate but I was busy with other things. I can confirm the dot problem is fixed, but this time on W81x64_ES_1.vhd and also on W10x64_MX_1.vhd even if lang is correct on VHD name, it was not applied to all the BCDs as it was before on first version, I assume when you edited the code you just forgot to add this feature, (it was working fine before, at least on W10x64_MX_1.vhd the right lang was selected on BCDs). For making new BCD entries there was only code to use default Language en-US, but now the Locale value is taken into account. The problem is that the generated entry refers to the VHD instead of to the mounted partition. 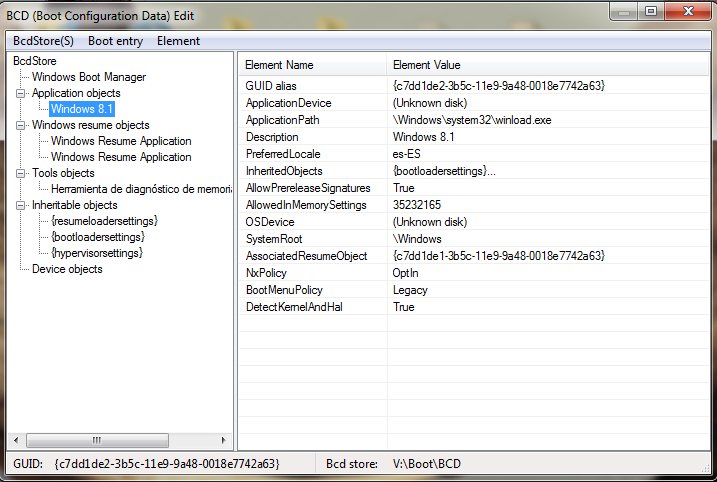 Do you you know the commands to get the correct entry for BCD inside VHD booting Windows of that VHD ? I need probably something else than device partition=N: but what code will give succes ? 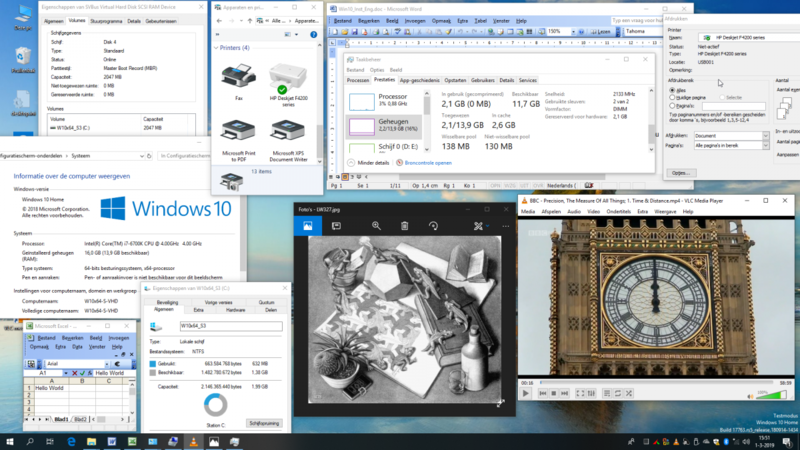 This time I used 10x64-WB.wim LZX compressed as source, located on Wimboot file on the USB, the program created W10x86_MX_1.vhd in a few minutes on USB device. All working as expected, not a single issue during building or during Rambooting the created VHD of 1.5 GB fixed size. So the program is totally fine as far as Apply, haven't tested Capture yet. As a personal test I manually changed grub4dos version from 0.4.6a-2018-12-23 to 0.4.6a-2017-12-20 and tested Rambooting the W10x86_MX_1.vhd without making any change to munu.lst, I mean the command map --top --mem was not changed to map --mem for use on the older version, and W10x86_MX_1.vhd Rambooted as fine as before. 2 - An option for the user to create Dynamic Expandable VHDs (They load on RAM like a lightning), not capable to Filedisk boot using grub4dos, but Windows manager boots them without any issue, and also we save more than 2/3 of VHD size = more than 66.6 % less espace used for the VHD. and/or (if needed) direct binary editing to further refine it. It is useful in Windows 7 x64 OS to make existing <Unknown> entry of BCD in Win10x64 VHD bootable. I can create also new working BCD entry using your code. An option for the user to create Dynamic Expandable VHDs (They load on RAM like a lightning), not capable to Filedisk boot using grub4dos, but Windows manager boots them without any issue, and also we save more than 2/3 of VHD size = more than 66.6 % less espace used for the VHD. Thanks, I have just added the new grub4dos-0.4.6a-2019-03-25 version. 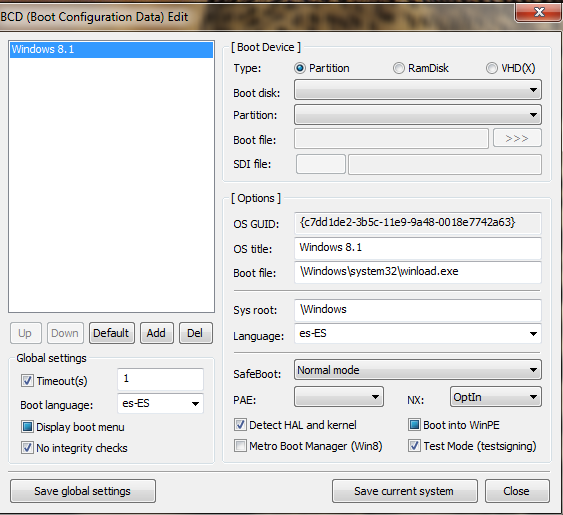 W81x64_ES_1.vhd was created running VHD_WIMBOOT from Win 7x64, external BCD is fine, including lang selection, internal BCD includes lang selection fine too, but the HD and partition to boot from are not selected, see attached picture. Probably there is only one entry which is not set as default. I will check it and find a solution. What does the entry look like in Professional mode ? This is it on Professional mode. Somehow the default entry has been removed. So I have to check if a default entry is present and otherwise create one. Normally Install creates a default entry. I haven't noticed it before because I have about 10 entries on my BCD, but during running VHD_WIMBOOT to create W81x64_ES_1.vhd from Win 7, my win10x64 Pro that was selected as default on BCD, was overwrited by W81x64_ES_1.vhd entry, so better delete the link to download that version 1.4, since it may create big troubles to non advanced users. OK, File has been removed.